BANGI, 23 December 2014 – Steps should be taken to deal with the depleting fish stocks all over the world brought about by higher temperatures and acidity levels due to the burning of fossil fuels. Prof Dr Atsushi Ishimatsu of Japan’s Nagasaki University said rising ocean temperatures and ocean acidification are radically altering the aquatic ecosystems, changing fish distribution and reducing the numbers of marine animals. He said global warming which brought about higher concentration of carbon dioxide (CO2) had generally led to marine animals eating and reproducing less. Giving a public lecture on ‘The Effects of Ocean Acidification and Warming On Coastal Marine Animals’, at The National University of Malaysia (UKM) here today, Prof Ishimatsu called on researchers at UKM to contribute data on the effects of ocean acidification in Malaysian coastal waters. “Data on the effect of ocean acidification and warming, on marine life have been rapidly accumulating but we still have limited knowledge about underlying mechanisms and how these marine environmental changes will affect the ecosystem structure and function in the coming decades,” he said. The lecture was organised by the UKM-YSD Chair in Climate Change and the Marine Science Programme of the Faculty of Science and Technology. Prof Ishimatsu, who did the research for the Graduate School of Fisheries Science and Environmental Studies in Nagasaki University, studied the Sea Urchin, a popular delicacy in Japan. “First, we exposed the temperate sea urchin, Hemicetrotus Pulcherrimus, to elevated CO2 conditions at two temperatures and quantified feeding, mobility and metabolism. The result showed that feeding was decreased with time and metabolism suppressed. At the end of 7 months of exposure, mobility had decreased while spawning was completely inhibited under the high CO2 condition,” Prof Ishimatsu said. Although his research team were not fish physiologists, they guessed that the effects resulted from damage to the fish’s muscle system at both the natural and higher temperatures. Similar studies had been done by Japanese researchers and teams in other countries on Krill in the South Pole, with similar results. Prof Ishimatsu suggested to Prof Dato’ Dr Sharifah Mastura Syed Abdullah, the UKM-YSD Chair for Climate Change, who was present, that researchers in Malaysia could do a similar study on a local common marine animal in Malaysian waters, such as shrimp or prawn. He said fish all over the world were already under pressure from over-fishing. This was being compounded by studies that showed global warming is also a threat to marine life. Of the CO2 emitted by fossil fuels, about 47% are absorbed by air, 27% by plants including forests and 26% by the oceans. Essentially global warming is caused by the increasing discharge of CO2, which leads to the oceans’ acid concentrations to go up. New research is finding that the introduction of massive amounts of CO2 into the seas is altering water chemistry and affecting the life cycles of many marine organisms, particularly the smaller ones. Increasing atmospheric CO2 has been diffusing across the ocean surface, acidifying the oceans thereby driving all marine organisms to live in more acidic environments. 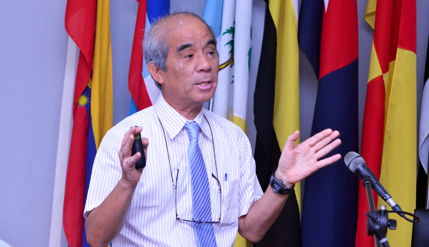 Head of Marine Science Programme at UKM, Associate Prof Zaidi Che Cob also attended the lecture.